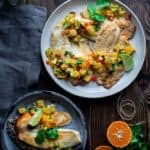 This Tilapia with Tangerine Salsa is flavored with bright citrus, cilantro and lime and it is so easy to make. It’s ready in just 30 minutes! Whisk lime juice, honey, galangal and ¼ teaspoon salt in a medium bowl. Gently stir in tangerine, scallions, bell pepper and cilantro and set aside. 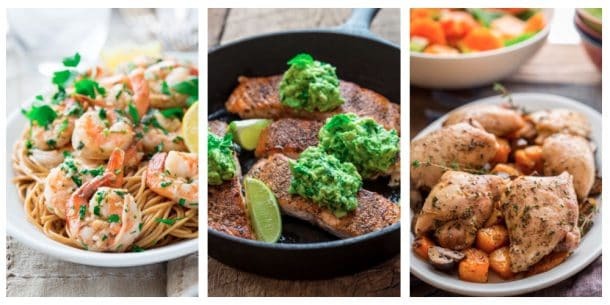 Place tilapia in a large baking dish. Sprinkle with the remaining ½ teaspoon salt. Sprinkle flour over the fish and turn to coat. Heat 1 tablespoon canola in a large non-stick skillet over medium high heat. Cook about half of the tilapia in the skillet until golden brown and cooked through, 2 to 4 minutes per side. Remove the fish to a plate and keep warm. Reduce temperature to medium-low and add the remaining 1 teaspoon canola oil to the skillet. Cook the remaining tilapia until browned and cooked through, 2 to 4 minutes per side. Serve the fish with the salsa.